The 1-Page Marketing Plan. Get New Customers, Make More Money, and Stand Out from the Crowd book just does that. Spanning 224 pages, the book requires you to invest $14 to own it (link). A self-published book that’s too good that it became #1 BestSeller on Amazon same month it started selling. This quick summary and review will get you up-to-speed to write your first marketing plan. The 1-Page Marketing Plan book starts with a great quote by one of the greatest minds that ever lived. The contrast between a genius and creativity is something that is well defined in this book. 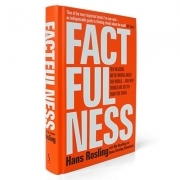 The author tells in the introduction part that he never had an original idea himself, but he tends to model things to create a better product. The book itself is a collection of great ideas that were put together to provide a marketing plan that will help you achieve success fast. The whole purpose was not to tell you that you should work hard, have talent, etc. but rather eliminate the factors that do not increase productivity. Allan Dib is an entrepreneur who knows the taste of success, and you are going to find a lot of useful tips that will save you time and money. An Australian situated in Melbourne, he has started enough businesses and startups to know enough about marketing. In the introductory part of the 1-Page Marketing Plan book, we will get familiar with the idea that most of the new business tend to fail in the first five years and the author mentions some good reason for this. The content is mainly focusing on training you as a better marketer and entrepreneur, and the first step to do this is to create a marketing plan. Marketing is the highest form of leverage any business owner can employ. There’s a reason Steve Jobs always approved every piece of marketing material Apple has put out. This book will help you master this art. Allan describes that in the “before” phase, you will be dealing with prospects, people that may not even know that you exist. This is why you have to find a target market and craft a compelling message for your target market. The intent of this phase is to familiarize your prospect with your brand and respond to your message. Once they show some interest by responding, they are going to become a lead and enter the second phase of your plan. Allan tells that selecting a target market is a crucial first step in the marketing process. This is going to ensure that your message is heard, making your marketing more effective. You have to focus on the right target market for your brand so that you will be able to save money and energy you invest. A major factor that leads to failure of a business is that entrepreneurs tend to acquire as many customers as possible and serve the widest market possible. This might be logical to some but, business owners will start to worry that they have to narrow down the target market because they don’t want to exclude potential clients. “A niche is a tightly defined portion of a subcategory,” tells Allan. A good example is to take the health and beauty category. Indeed, this is a very wide category that comes with a lot of niches. However, you have to find a niche that is not saturated like: focus on cellulite treatment for women who’ve just had a baby. Personal Fulfillment, Value to The Marketplace and Profitability. Do you enjoy dealing with your customers? Make sure you do and you provide a good customer service. Does your niche have enough value to the marketplace? Are you going to make a big profit out of it? If the answers to these questions are positive, then you are taking the right road to success. If not, consider changing something. Success is not all about hard work and motivation; you have to know why you are doing this and consider that you have the human factor. Are you doing this for money or pleasure? Combine both. The ineffectiveness of your message is boosted if it is boring and timid. You have to stand out from the competition and craft a compelling message that grabs the attention of your target market. A prospect happening upon the right at the right time will result in the happy accident of a sales taking place. However, if these “accidents” would happen, no one would ever advertise. This tortures entrepreneurs to death because while the ad will consume them money, they fear not running it; who knows, next week it may bring that big sale they’ve been waiting for. Marketing is not a slot machine in a casino. You don’t put your money in it and hope for a jackpot. You might get a few cents on the dollar you spent and it will raise your hope and embolden you to continue. You know, most small businesses do not have a purpose. If you take away the logo and the name, you’d never know who they were. If you are a customer, there is no compelling reason to buy from them, and the sales they make are because they just happen to be there. You need to afford the time, money and effort that is needed to get it right. Do not launch yourself into the business if you have a “me too” style of the offer because you will have no hope. Marketing is an amplifier and an uphill battle, and you have to know in your mind why your business exists and why people should buy from you rather than from your competitors. Quality and great service must be part of a good business practice but not something unique. When your marketing of your business is a commodity, prospects will start the conversation by asking the price. You have to position yourself differently so that prospects are will make an apples-to-oranges comparison when they compare you with another competitor. Advertising media is going to boost the reach of your target market and communicate your message. This is the most expensive component of your marketing, and it has to be selected and managed carefully to ensure that you get a good ROI (Return on Investment). The Internet and social media are the new ‘thing’ of marketing. You have to learn how to adapt and get known by using it. However, there are “many self-proclaimed social ‘gurus'” that are going to make you believe social media is the future of all marketing and that you’re not dedicating all or most of your marketing resources to social media. The hype is real but, don’t fall into it too soon. 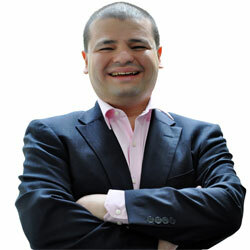 Allan is not against social media as he has used it in multiple businesses and continues to use it on a regular basis. To be successful, you have to hit all three of these. Make sure that you send the proper message to the right target market, through the right media channel. Your marketing campaign might fail if you fail any one of these three elements. Remember that social media is ‘media’ and not a strategy. Before you start your social media campaign, make sure that you have a budget. You have no idea if your marketing will succeed or fail because you aren’t measuring the results. Your marketing succeeds, and you make a profit out of it. If your campaigns consistently fail and you lose more money than you spend, stop and change what you are doing. Measure your results with the technology and software we have readily and cheaply available. If your campaigns work and you get a consistent positive ROI, spend as much money as you can doing what you were doing to get these results. You have to consider the power of email marketing. Emails are direct and a personal way to engage with prospects. Thanks to smartphones and mobile devices, everyone has email within easy reach. Build a database of email subscribers; this will play a significant role in your online marketing strategy. The opportunity to nurture the traffic who may not be ready to buy immediately is captured by your website that has an opt-in email form. Email also enables you to maintain a relationship with your client base, and it makes everything easy to test and launch new services. Over time, you will see how emails are building a relationship with subscribers and your database is becoming a valuable marketing asset. 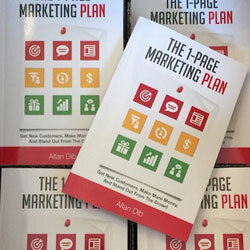 In this part of the 1-Page Marketing Plan book, Allan talks about leads. The goal is to get your customers to like you and appreciate the service you offer. They have to familiarize with you enough to buy from you for the first time. Once they’ve bought from you, they become a lead and enter the third and final phase of your marketing funnel. It is critical for you to capture leads in a database system. You have to understand that only a tiny percentage of interested leads are ready to purchase from you immediately. To attract the attention, you have to handle interest and build your future sales pipeline properly. Allan describes this process as a comparison between hunting and farming. In his experience, most newcomers are hunters and not farmers. They spend a large sum of money and time to get new customers and do anything to make the sale as soon as possible. The advertising reeks of desperation because they try to discount the price just to make a quick sale. They waste their time to attract people who are not interested in their service. Most new entrepreneurs are clueless about the purpose of their marketing. In a target market, the prospects must not be treated equally. You have a limited supply of money for your marketing campaign, invest it wisely. You have to force yourself to spend marketing to high probability prospects. When you spend $1000 on an ad campaign that reaches 1000 people, you spend $1 per prospect. Let’s assume that out of the 1000 people, 100 are potential prospects for your service. If you treat them equally, you are going to waste $900 on uninterested and unmotivated prospects to reach the 100 who are interested. You have to sift, sort and screen in order to deal with high probability prospects and not waste your time and marketing budget on uninterested traffic. This is why a better choice is to spend the whole $1000 on the 100 high probability prospects. This will allow you to spend $10 on each of them instead of measly $1 per prospect you’d have if you treated them all equally. Now it’s time to manage your goldmine. Some brands are getting a constant flow of leads and prospects while others struggle to get any. The reason for this is – the infrastructure. The experienced entrepreneurs have built a marketing infrastructure that brings new leads regularly which nurtures and converts them into loyal clients. These random acts of marketing end up costing more than they bring in, which demotivates the business owners. When you build a system, think it through from start to end. Make a plan and understand how it works and what resources you will need to run it. The most vital factor of your marketing infrastructure is your database of customers and prospects. The nurture of your leads is the process of taking people from being not interested in your services and fill their desire to buy from you. This process is making your leads interested, motivated and qualified to do business with you before you try to sell something. A good marketer will focus heavily on marketing and make a lot of offers. When you make many offers, you get a good sense of what works and what doesn’t. Practice makes it perfect. A prolific marketer has the ability to spot trends and scientifically measure response by split testing. Take risks and use the good content. Making this kind of content and more frequent answers is simple. When you are becoming more prolific with your marketing, you will create a buzz in your business. You will become noticed faster and fill up your sales pipeline. The changes you make that become part of your routine, either positive or negative, are going to have a heavy impact over time. Getting good at the science of marketing is the step you have to take in order to achieve rapid business growth. Daily – Check your social media campaigns for messages and respond appropriately. Weekly – Make a blog post and send the link in an email to your subscriber’s list. Monthly – Mail your clients and prospects a newsletter or a postcard. Quarterly – Send old customers who haven’t purchased anything for a while a reactivation letter. Annually – Send all clients a gift or a service thanking them for their purchase. In addition to this, you have to consider event triggered marketing activities like meeting a potential prospect at a business event. Get an inbound sales inquiry; When you receive a customer complaint, and you resolve the issue, send them a handwritten apology and a discount coupon on their next purchase. Even if your business is currently small, hire a manager that will help you “run the factory” for you and make sure your follow your schedule. There is no money in your product or service. What made the dramatic difference? Positioning. Positioning is the art of creating value for your products and services in the minds of your customers. … or some hack who is only good to play his notes on the streets. Sales conversion depends on whether you create enough trust and you demonstrate the value of your service or product. You have to position yourself correctly in order to make the sales conversion process natural and easy for both you and your client. When you want to sell something, you have to create trust first. Most new marketers use the cold-call or advertise using outdated methods that no longer work. The main issue is that you want your customer to buy your service when they don’t know who you are and what you represent. They have no idea who you are, they might not like you, and for sure, they don’t trust you. Allan describes this as a marriage on the first date – it may work once in a blue moon but do you really want to risk like that? You will definitely end up with a poor closing ratio, and you will waste an enormous amount of time, money and energy dealing with inappropriate prospects. To resolve this issue, you need to educate yourself. “With education, you build trust. Instead of trying to sell something immediately, the first thing you can do is to offer your prospects something of value that educates them about the issue they have. A listicle, a blog post, free CD, online webinar, any educational tool that you can use is going to work. You show that you’re willing to give long before you take, which breaks down sales resistance. You are going to be regarded as an educator and expert in your field. Remember that you are running a small business and that puts you at an immediate disadvantage. A vigilant prospect might see you as trustworthy, but the vast majority of prospects won’t go to the effort to do in-depth due diligence. Avoid this by presenting your business in a way that conveys trust and confidence. Your website is the first places your prospects go to check you out so make sure that it provides a good value. Don’t use your phone number in a list. Let them see it at the top of every page. Don’t underestimate the importance of design; you can’t be cheap when it comes to the website’s template. Choose something that is relevant to your brand or niche. When you set the price on your services or products, you can make it slightly lower than the market leader in your industry. You can also set it to take cost price and then add what feels like an acceptable markup. These factors can give you bonus points, but if you don’t know your real value, you can’t decide yet on a specific price. You need to resist the urge to discount. 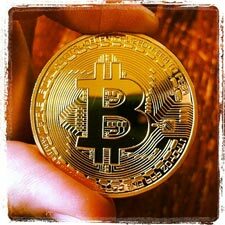 The strategy has to be used with extreme caution because it can put a lot of pressure on your profit and more importantly, your market position. When you have a loss leader strategy, you have to avoid discounts. With it, you try to entice a client based on price and then upsell other higher margin services or products. Here it is, the last phase of dealing with customers. Imagine that: Clients are people with feelings and emotions, just like you, and you have to offer enough in order to get paid at least once. This part of the 1-Page Marketing Plan book tells you how to turn your one-time clients into loyal ones by delivering a high content quality. You will create an environment where referrals can’t help themselves but come your way. The goal is to get the trust you need and have your services required constantly. When you deliver a world class experience, you turn your clients into a crowd of raving fans who want everything new you have to offer. To have this world class experience, you need to implement systems in your brand and make smart use of technology. Building your “crowd” is not easy. This group of clients is “connected to one another, connected to a leader and connected to an idea” as Allan describes. Just like our ancestors, “human beings have been part of one tribe or another”, adds the author. The difference between a good business from ordinary ones is that they lead their tribes of raving fans. In your marketing plan, a tribe member is a prominent type of client. He acts “as a cheerleader” and is the catalyst for your success. These tribe leaders will amplify your message and boost it to high heights. They focus on surprising the customers who later turn them into raving fans. They create and take care of lifetime relationships with your brand. And they have a system that delivers a great experience consistently. This chapter also shows you how to create a good offer while knowing exactly what your market wants. When you promote your product, you have to make sure that customers want it but mostly, need it. “There’s often a big difference between what people want and what people need. Let me give you an example. Let’s say you’re a fitness instructor. You improve people’s lives through better health, fitness, and nutrition. Promote your services / product by giving your customers related content about it. Some business owners feel like this is not their responsibility, which their customer should know already what they have bought. However, this is a trait for a bad entrepreneur. You live in a world that’s fast paced and so many competitors are always one-step ahead of you when they implement this factor to their business. Use the technology available to promote your brand. The rate of technology innovation has been nothing short of astonishing, and while the pace of technology has increased and continued to increase, the purpose of new technology remains constant. Allan tells that the purpose of new technology is to eliminate friction in your business. You need the fastest and easiest path to the sale, while you also increase the customer’s satisfaction. You most likely want to avoid issues where technology hinders rather than facilitates your business. The plain and simple purpose of any new technology in your business is to eliminate friction. We want the fastest and easiest path to the sale, while increasing customer satisfaction. We also want to avoid situations where technology hinders rather than facilitates business. Technology made our lives easier by doing the heavy work on our behalf. Sometimes you need to implement technology for its sake. “I often ask people what the purpose of their website, Twitter or Facebook page is. I rarely get a succinct and direct answer,” adds Allen. When you reduce friction, technology saves the time that you would have to spend to accomplish something. But how can you ensure technology isn’t hindering your relationship with your subscribers? Yes, this is a major step. You have to increase the lifetime value of existing clients that spend a lot into your brand. Implementing strategies and tactics that make existing customers spend more money is a good start. In this chapter, you will also find how to manage and improve key numbers in your business. Allan focuses on the “back-end” in this chapter. He then mentions that this is the chapter where the real money is made. While most of the book focuses on getting new customers, Allan tells that this is only one of the two ways to grow a business. The other way is to harvest more from existing and past clients. They increase revenue and profit from existing, and past clients and they view this action easier than getting new ones. A relevant statistic is that a person is 21 times more likely to buy from a brand whom they’ve bought from in the past compared to a brand that they’ve never purchased from. It might sound stupid to you but a good way to increase the lifetime value of a customer is to raise the prices simply. Most new businesses fear that raising prices would lead to a backlash from customers. Remember that everything has to be handled strategically. Doing this you will find out that most customers don’t mind the evolution of price that much. If you reverse roles and think on your own purchasing habits, you often have caught yourself using your card without even looking at the total. Allan personally finds this case very often, especially when it comes to lower value services and products. The key to raise your prices in a way that won’t do any damage to your clients is to give them a reason why. Explain to them how valuable is the quality of your product, hence the increased cost. List the benefits they’ve already got from your service and how they will benefit from your new innovations. Yes, some clients will turn you down but those are the ones that were the least valuable. Focus on customers that are NOT won on price. If you do it right, you will see a major increase in your profit gained by the rise of your prices without losing revenue from price sensitive churners. The key to raising your prices in a way that makes it palatable to your clients is giving them a reason why. Explain to them the increases in quality of your product or the increased input costs that you’ve borne. Explain to them the benefits they’ve already received from your offering and how they’ll benefit from your future innovations. Some percentage of customers may leave you despite your explanation; however, they tend to be the lowest value customers. A customer won on price will be lost on price. If it’s done right, the increase in profit gained by raising your prices will outweigh any lost revenue from price sensitive churners. Increasing the frequency of your customer’s purchases is another solid strategy that leads to the increasing of lifetime value. Reminders: Sending reminders can be automated. Take advantage of technology. Reminders are goods and services whose benefit or usefulness expires over time. Give them the reason to come back again. Vouchers and discounts are some of the things that help in achieving this target. In the last chapter of the 1-Page Marketing Plan book, the author focuses on orchestrating and stimulating referrals which are active processes. Most of the new business owners hope for referrals but do not have a good system for making them happen. When you implement simple tactics, you will make the flow of referrals come with ease. Word of mouth is the equivalent of a “free lunch” in the author’s words. It comes as a privilege, and you appreciate it, but you don’t want to rely on it to feed yourself and your family. This factor is applied to the psychology behind referral marketing. The same concept you want to use in your referral marketing system but don’t hope and wait that someone is going to discover you and share your brand. You want to orchestrate and stimulate the process. “Ask, and you shall receive” is another important tip that describes the power of asking for something. The 1-Page Marketing Plan book concludes by drawing your attention to the importance of building your brand. You learn that there’s an enormous amount of confusion, especially for new marketers, in the search of creating a quality brand. 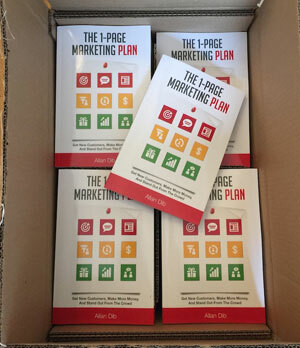 Finally, you can download this summary of the 1-page marketing plan book in pdf format from this link. So what are you waiting for, get cracking and write your marketing plan now.